Located in one of the dark and narrow alleys in the historical part of Stockholm known as “Old Town” (Gamla Stan), the consignment store Liten Amanda is almost literally a hole in the wall. The day I’m visiting the store is a gray and dusky day, but Liten Amanda’s window display is shining bright. In the window a large, white Moomintroll lamp is glowing next to a similar Hattifnatter one. – Aren’t the lamps in the window lovely? We recently received them from Feelis, and they’re already a success with our customers – perfect for brightening up the dark Nordic winter. The store is absolutely packed with different things: interior decorations, art, party pieces, toys and fashion accessories. I recognize Moomin on a large amount of them and proceed to ask Angela some questions about the relationship between Moomin and Liten Amanda. 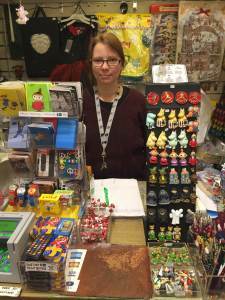 How long have you been selling Moomin products in your store and why did you start selling them? I grew up with the Moomins myself, but I was never a huge fan. So when I started Liten Amanda 20 years ago I’d sort of forgotten about them. My daughter-in-law is responsible for re-reminding me about Moomin about five years ago. 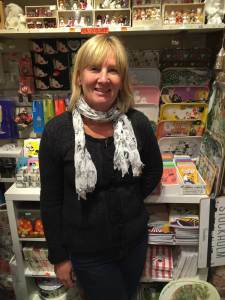 She’s an adult Moomin fan and told me all about what makes them so amazing. She showed me how many different Moomin products existed and I realized that many of them would be perfect for Liten Amanda. Today we sell hundreds of different products from dozens of brands. The most popular character among the Swedish kids that come to the store is actually the frightening Groke! So all of our Groke-themed products, especially the stuffed animals, sell out very fast. And the Moomin Mugs from Arabia of course, they’re super popular. What type of customers most frequently purchase Moomin products? Surprisingly we do get plenty of Finnish customers, a lot of them say our selection of Moomin Products is even better than the Finnish Moomin shops’, which is nice to hear. Then of course we get a lot of Japanese customers – they adore Moomin over there! We are actually the number one shop in Stockholm if you measure the amount of Tax free products sold to Japanese tourists. 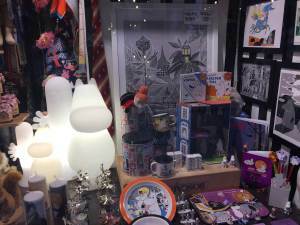 The Japanese tourists usually get incredibly excited when they see all the Moomin products, especially the wall of Moomin Mugs. What do you think is the reason behind Moomin’s popularity? I think it’s because there are suitable Moomin products for everyone, child or adult. From our products it’s mostly cute and colorful toys and stuffed animals that appeal to kids, while adults like the more subdued and minimalistic interior items, usually featuring original artwork by Tove Jansson on them. 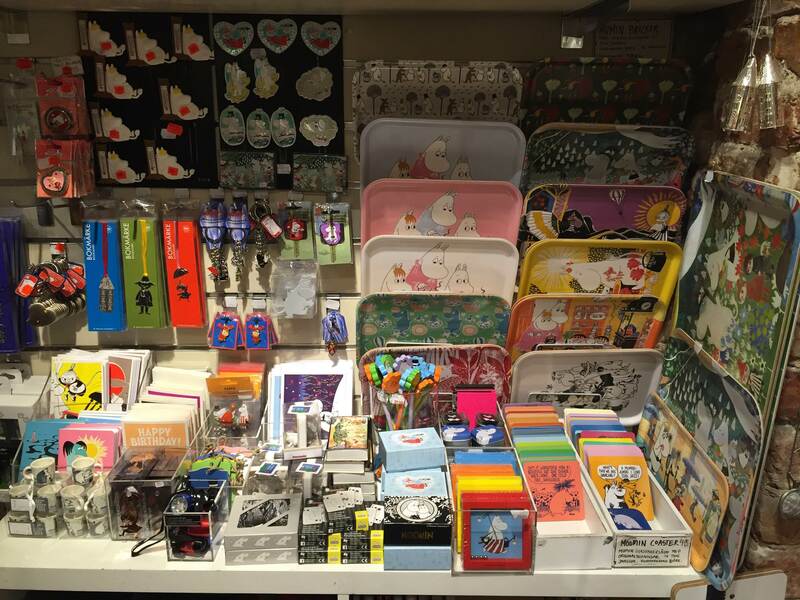 Do you have a fun Moomin memory to share with us at Moomin Product Gallery? My funniest Moomin memory actually has nothing to do with our store even though some exciting things have happened here. No, this happened when I was in yoga class. At the end of the class the instructor was reading some nice poetry while we were stretching and calming down. I remember thinking the text was incredibly deep and moving. Then the instructor ended the reading with “…said Snufkin”, and I realized that the Moomin books are much deeper and more mature than I’ve ever realized! Visit Liten Amanda webbshop at www.litenamanda.se or visit the store at Västerlånggatan 69 in Gamla Stan, Stockholm.